Theoretically, a Kinetic charge converts into an extra turn. Not, of course, in my experience of Gambit. Not with any reliability. But Bo Roulette used in that extra turn counts as a turn. In other words, Kinetic Charge is consumed by Bo Roulette in such case. 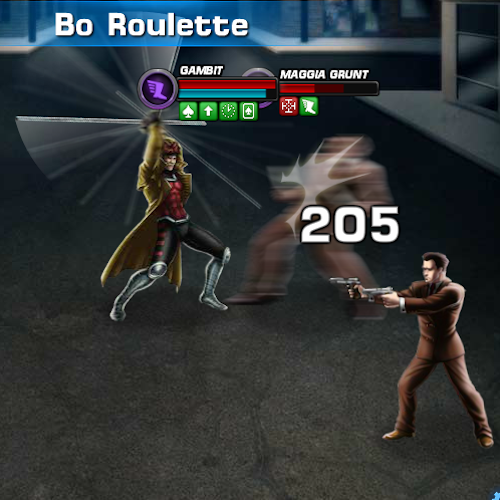 Bo Roulette should be Gambit’s automatic opening move (free turn) in every fight. It occurred for a short period during Gambit’s level up, but Bo Roulette as a free-turn gambit (opening move in chess) should, in fact, be a permanent aspect. Consumes one Kinetic Charge to grant ONE extra turn. As far as I’m concerned, one should be able to release as many Kinectic charges as are available (maximum 4). This might lend to some strategy which is sorely lacking in the game. Honestly, Exposed is an incomplete representation of the effect of explosive force. Dizzy must be added for 3 Turns. Furthermore, this should be a stealthy attack that bypasses Protect, Shield Guard, and Counter-Attacks, etc. If you think this would make Gambit “overpowered”, then reduce the damage range of Ace of Spades by half. Defense reduced by 25% for 3 Rounds. Deals Extra Damage on Critical Hits. Generally unimpressive. There’s no rage here. And nothing spicy, tempermental and cajun about it. All that stamina and foot work! I’m reminded of Lord of the Dance. And that’s not a good thing. Ignore Defense must be added to Ragin Cajun if there’s any cayenne left in the kitchen cupboard. Removes Beneficial Status Effects from the Target. For example, You know how Thor’s uniform has him ready to Hammer Throw? Not if Gambit debuffs him first. Theoretically. 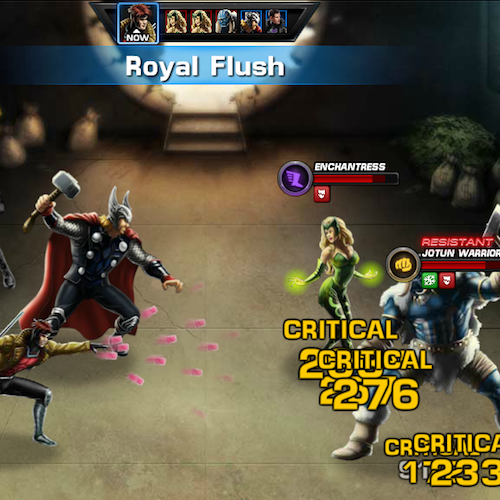 Scarlet Witch’s Reality Warp should be removed. As should Inspiring Leadership. Apparently, buffs are not being removed. Wow. Really good shizzle. Throw in Weakened for 2 Rounds for explosive measure and we have a hero (anti-hero?) second only to Captain America. To Gambit or Not To Gambit? Gambit is good. 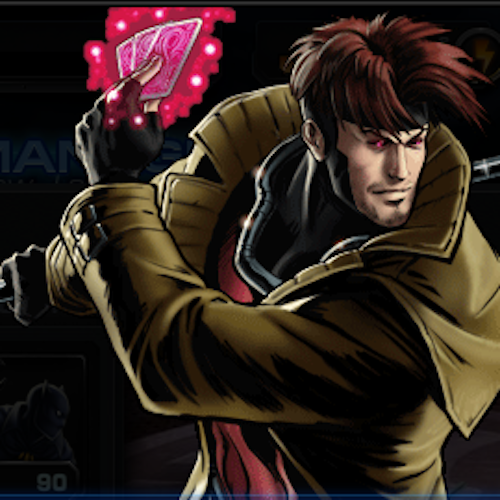 With some very small upgrades, Gambit could be awesome and, perhaps, live up to the expectations of his fans. Or, maybe Playdom-Disney just needs to execute on the special abilities that they have defined. 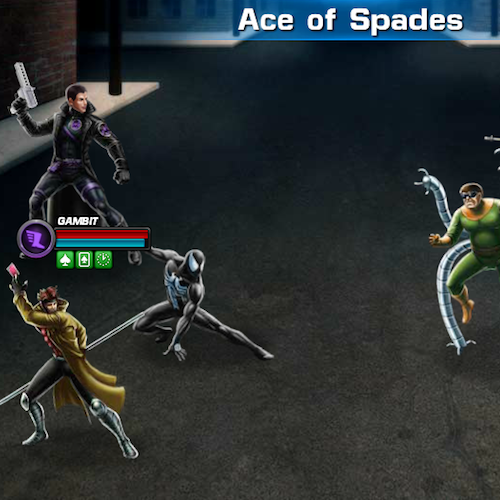 There are rumors that the Gambit and Future Foundation Invisible Woman are the new black in PVP. That may, indeed, be true at the time that I wrote this profile. 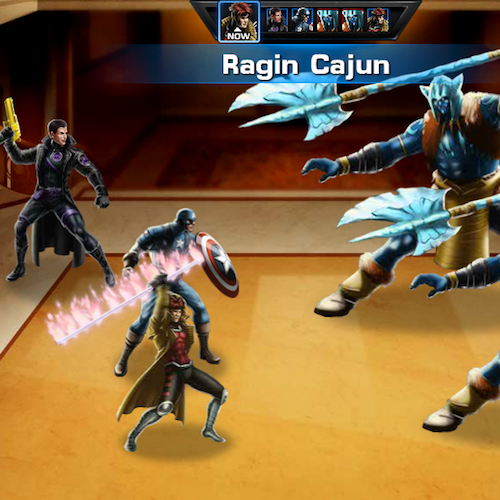 Then again, if Playdom-Disney (P-D) does the old bait and switch trick yet again and P-D nerfs Gambit – Gambit won’t be worth 90 Command Points. Maybe 42. Maybe. Should you get Gambit right now? Or as soon as possible? It all comes down to a simple question. Gambit’s story is a story of misdirected energy, poor, explosive choices, and, naturally, unfortunate associations. 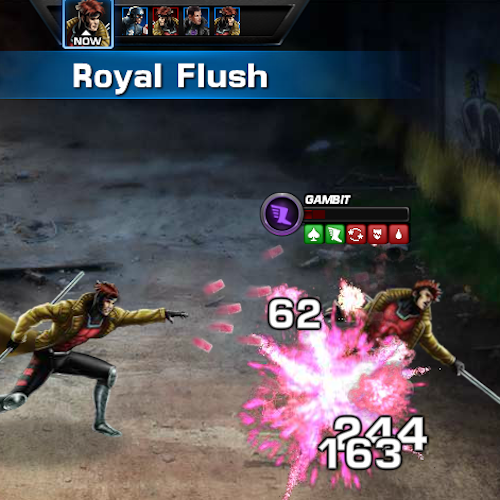 Gambit is the bad guy – even if he does a little good every so often. Even if he doesn’t know it himself. His time as an X-Men curries him no merit worthy of our consideration. Gambit cannot be trusted. He brutally attacked his lover, Rogue, when it suited his purposes. Gambit serves himself with little or no regard for others – their freedom, their happiness, or a better world for all. But, perhaps, there is hope for Gambit. Just like there is hope for you and me. Perhaps, the hero, the goodness and the light will prevail. If we fight the good fight. If we believe. Every day. P.S. Inaccuracies are due to a lack of sleep. More importantly, MANY thanks to my friends and allies at the OMEGA guild on playdom.com for helping me to raise the energy and keeping me awake to level Gambit up to Level 9 in the blink of an eye. This entry was posted on Wednesday, August 29th, 2012 at 2:33 am and is filed under Games. You can follow any responses to this entry through the RSS 2.0 feed. You can leave a response, or trackback from your own site.